On October 10, the United State Postal Service filed notice with the Postal Regulatory Commission (PRC) for price changes that are scheduled to take effect on January 27, 2019. The postal rate increases, which have already been approved by the Governors of the Postal Service, would raise mailing service product prices by 2.5 percent. 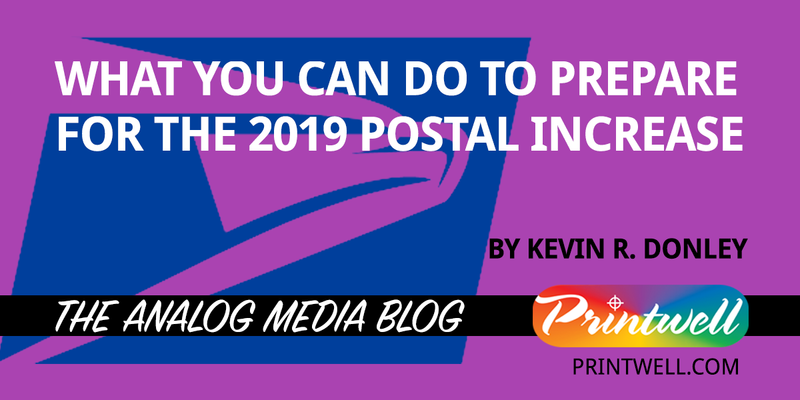 If approved at an upcoming meeting of the PRC—and there is every reason to believe they will be approved—this will be the third annual postage rate increase in a row. Rising mailing costs, like the recent increases in paper costs, are now confronting printing customers with yet another economic challenge. Fortunately, there are options available that can help you to manage these cost increases. Here are just a few things to consider as you plan your marketing, communications and publishing budgets for the coming year. 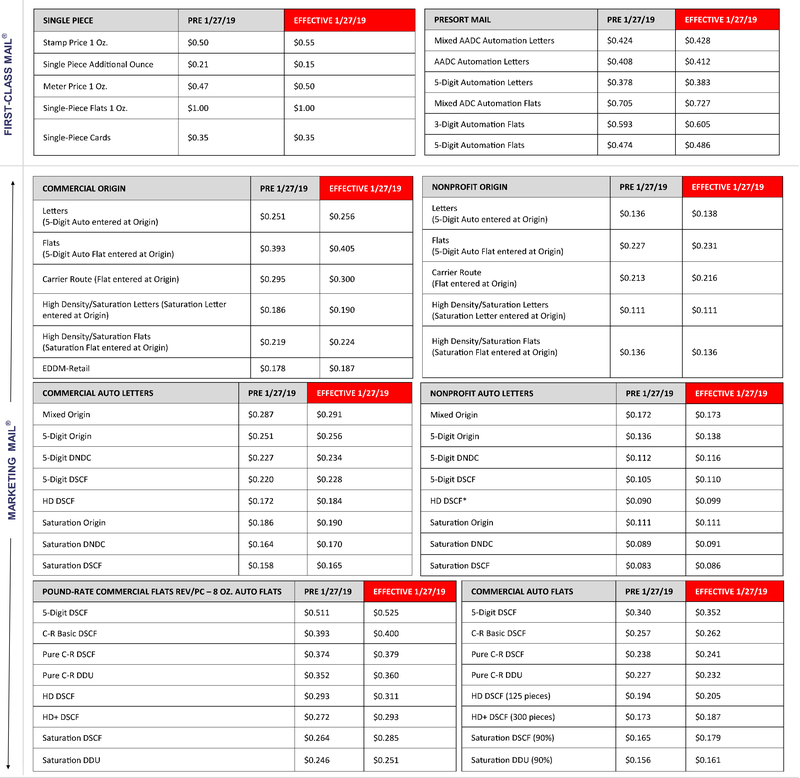 One way to adjust the cost structure of your print media is through alternative formats, i.e. page size, folding and binding. Sometimes, a small adjustment to your page size can alter the economies of scale in the way your project is oriented on the printing sheet or the even the press that it will be printed on. The savings can be significant especially on publications with many pages and multiple press runs. By adjusting the dimension, for example, you may be able to increase by 4 or 8 the number of pages per press run. This will reduce the press time and translate into significant cost reduction. Additionally, it is important to consider carefully how you can optimize your postage costs with the adjustments to your page sizes. If you are producing a folded brochure or direct mail piece, it may be possible to alter the way it folds and reduce the folding time required. Projects with multiple panels, for example, with a roll-fold can sometimes be reconfigured for a double parallel fold. Binding options also impact the cost of postage. Saddle-stitched booklets with wafer seals that are also no larger than the maximum letter size (6-1/8″ x 11.5″) can be mailed at the least expensive automated mailing rates. On the other hand, booklets that exceed 1/4″ thick or are larger than the above maximum letter size must be mailed at the more expensive flat rate. There are many options when it comes to paper cost. Coating, finish, basis weight and grade all impact the cost of paper. It is important to know that, due to changes in the printing paper markets, it is often the case that uncoated papers cost more than coated papers. Meanwhile, the differences between paper grades (ranging from grade 1 with the greatest brightness to grade 5 with the least brightness) are not strictly defined. It is important to consider the actual brightness value of the paper you are selecting. It is possible, for example, to use a #4 grade paper from one manufacturer that is marginally different in appearance to a #3 grade paper. When it comes to direct mail, it is critical to consider the possibilities of targeting customers and prospects with personalization beyond the name and address on the mailing panel. With the sophistication of digital printing technology combined with good customer data, it is possible to reduce the total number of printed pieces and increase dramatically the overall response rate from direct mail programs. At Printwell, we are committed to keeping our customers informed about the changes in market conditions that impact print media content, production and distribution costs. Please contact your account representative for a consultation on any of the above recommendations or send us a message here and someone from our sales team will get in touch with you.